40th Anniversary Logo — UTech, Ja. 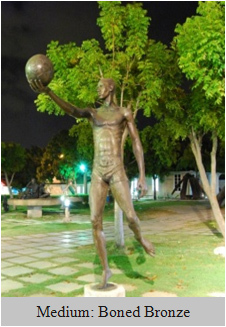 This sculpture is a life sized figure of UTech, Jamaica’s 40th Anniversary logo. It is a symbolic figure, reaching out and upward, with the world at his hand. Under the banner, “Technology driven, development bound”, it heralded the new direction of the University of Technology, Jamaica. The artist regards this creation as an honour as he sees it contributing to the regional integration of the Caribbean through the medium of art.